If you are interested in any of our testing capabilities, please contact us using this form. 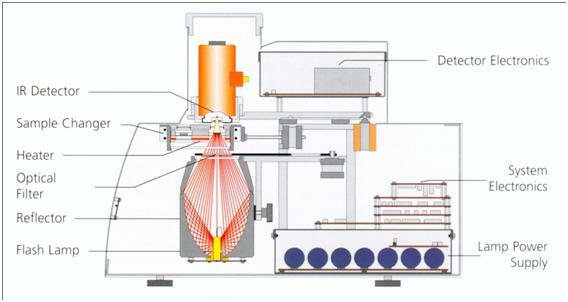 We have an assortment of various test systems that can be used to measure the kinetics of ignition and combustion, flammability and deflagration overpressures. The effectiveness of fire suppression and other protection systems can also be evaluated in these systems. We complement our in-house capabilities with strategic partnerships with larger organizations, universities and defense labs where large scale tests can be conducted. This strategy enabled us to work with sample sizes ranging from a few milligrams to several kilograms of the flammable material. 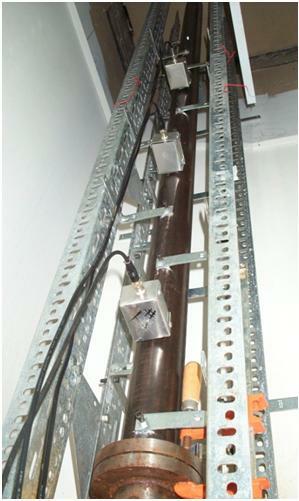 Photograph of instrumented combustion tube. 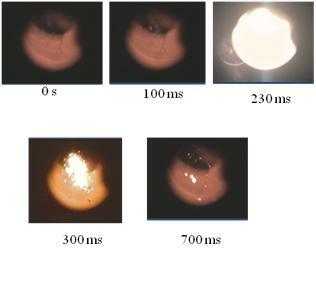 A Sequence of photographs from a combustion test on biological particulates. 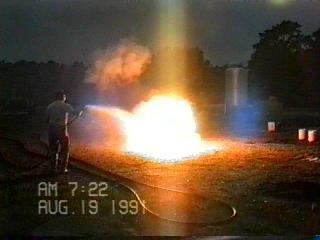 Example: Spore Ignition Tests. We performed ignition tests on live Bacillus anthracis spores and its biological simulant (Bacillus thuringiensis spores) in a one-of-a-kind instrumented and calibrated combustion tube to measure the kinetics of ignition. A photograph of the combustion tube housed inside a BSL glove box is shown below along with a phase contrast micrograph of the Bt spores prior to introduction into the combustion tube. We have two multi-phase shock tubes that we used to study the shock propagation in bubbly liquids and liquids containing bubbles and solid particles. We used this system to characterize the shock attenuation and shock speed reduction with travel distance. BlazeTech's instrumented multi-phase shock tube and pressure-time histories measured at two locations in the shock tube filled with bacteria-water slurry. 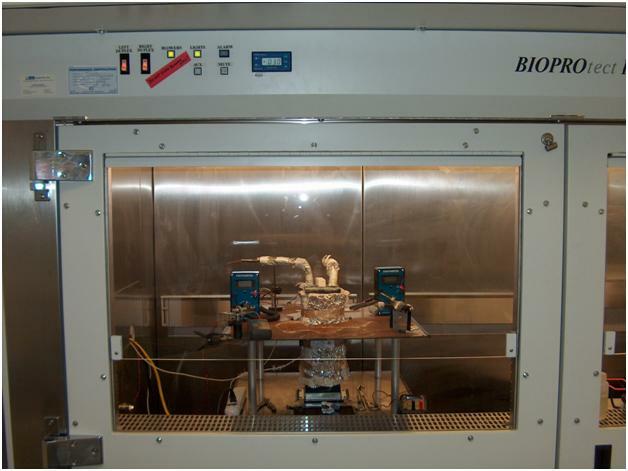 We have a reactor that we can be used to study the neutralization kinetics of bacteria due to heat and oxidizers. 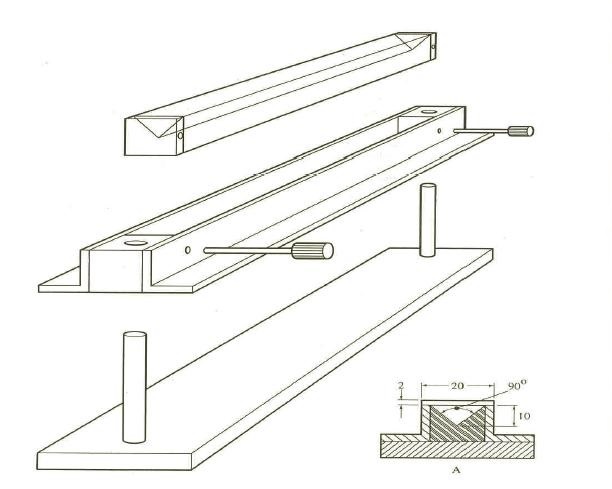 A schematic of the test setup is shown below. 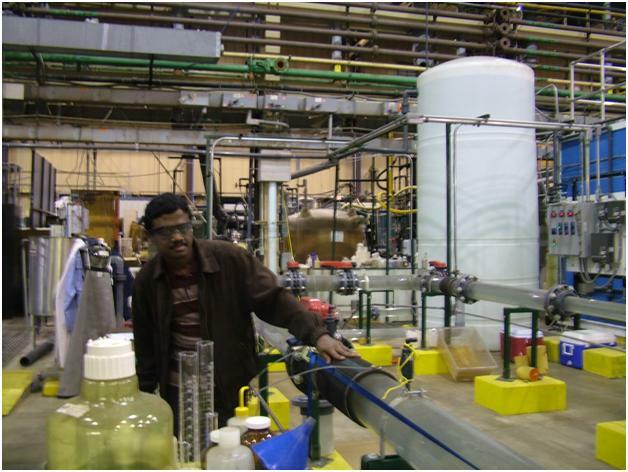 We have access to a test facility where large scale combustion tests can be performed on various flammable materials. Tests show videos and IR videos of the combustion of Magnesium particles. 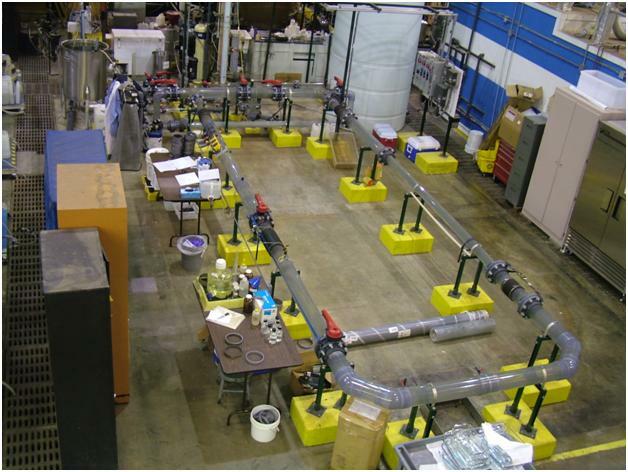 We performed loop tests at the EPA T&E Facility in Cincinnati, OH to study the interactions of bacterial contaminants and pipe walls and residual disinfectant in bulk water. 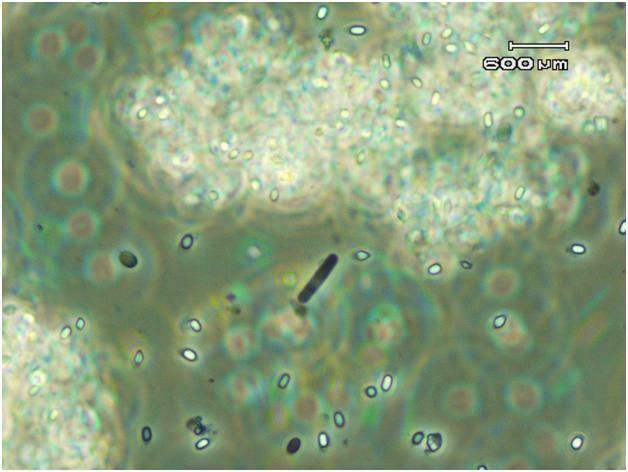 We examined various types of pipe walls (ductile iron, cement lined ductile iron and PVC) with and without a biofilm. 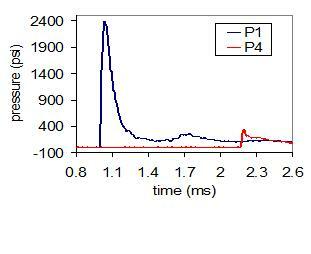 We developed kinetics models based on the test data. We performed elemental analysis of a biological sample using ASTM D 5373 (for carbon, hydrogen and nitrogen), pyrolysis method (for oxygen), ASTM D4327 (for chlorine), and ASTM D4239-83 (for sulfur) to determine its overall molecular formula. We performed combined Thermogravimetry- Differential Scanning Calorimetry (DSC) Mass Spectrometry (MS) measurements on a biological sample both in air and in inert atmospheres to determine the onset temperatures for various processes (such as drying, pyrolysis and combustion reactions), heats of reactions, mass loss due to each reaction and the composition of products from each reaction. We used NETZSCH's simultaneous thermal analyzer (STA) 449 C Jupiter for TG-DSC coupled with NETZSCH's quadrupole mass spectrometer (QMS) 403 Aeolos to perform these measurements. We used Bureau of Mines R.I. 5624 to determine the minimum ignition temperature of a dust layer and U.N. Test N.1 to examine the ability of a particulate substance to propagate combustion. We measured the dynamic viscosity of particle suspensions in water as a function of particle concentration, temperature and shear rate using Brookfield LVDV-III+ Rheometer with a V-73 spindle and developmental extender, in a Brookfield Thermosel. We fitted the test data to a simple engineering model. We used the Maximum Bubble Pressure tensiometry (MBPT) method to measure the measured the dynamic surface tension of particle suspensions in water as a function of particle concentration, surface age and temperature. We fitted the data to an appropriate model. 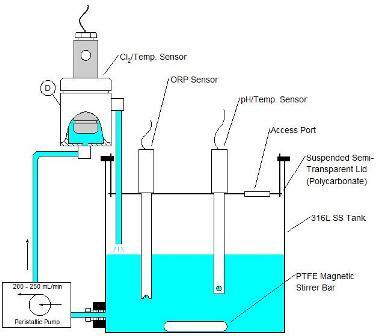 We used Micromeritics AccuPyc 1330 pycnometer to measure the density of particle suspensions in water as a function of particle concentration and temperature. 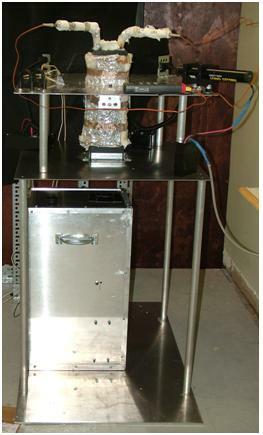 We developed a method to account for the effect of water vapor pressure on the density measurements. We used NETZSCH's LFA 447 NanoFlash method to measure the thermal diffusivity of particle suspensions in water as a function of particle concentration and temperature. Schematic of NETZSCH's LFA 447 NanoFlash Instrument used to measure the thermal diffusivity of condensate phase materials. 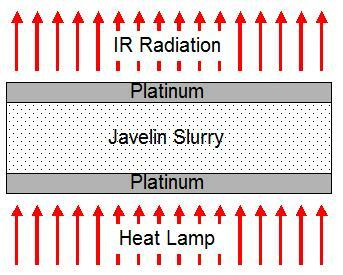 Cross-section of sample carrier used for thermal diffusivity measurements on a Javelin slurry sample.